This dish has been stalking me over the past week, I swear. I have been out and about for lunches and brunches and breakfasts over my winter vacation and this entree has been popping up everywhere. Even my cookbooks and food periodicals have been hinting at me to cook it. Last night I gave in. After purchasing a deliciously decadent 500g piece of rib-eye fillet (because I am a Cave Woman Carnivore), I went to the seafood section and purchased 2 squid tubes. I am not much of a seafood eater, but I do enjoy calamari and cuttlefish. I even like it 'sashimi style' - eaten raw. 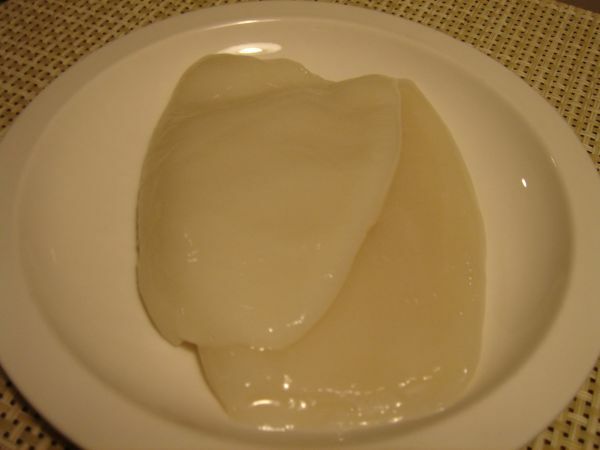 It has a slight chewy cartilaginous texture which is lovely, and an almost 'nothing-whiff-of-the-sea' flavour. But I digress. I felt like a sinful little entree of deep fried squid before my meat and potatoes and that is exactly what I had. The recipe is pretty simple. Here is the MO for 2 squid tubes. Heat oil in your frying pan. (about an inch should be enough) You will know it is hot enough when bubbles form around the end of a wooden spoon when submerged. Put peppercorns, salt, chili flakes and five spice into a pestle and mortar or spice grinder and grind to a powder. Set aside. In a bowl, place rice flour and 3/4 of your spice powder and mix to combine. In a separate bowl, lightly beat your egg white. Add squid to egg white and toss to coat. 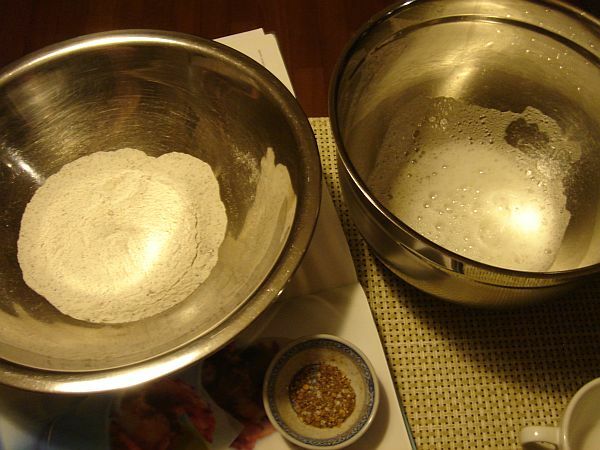 Transfer to rice flour and spice mixture and make sure you get good adhesion of the flour to the squid. Shake off excess flour. 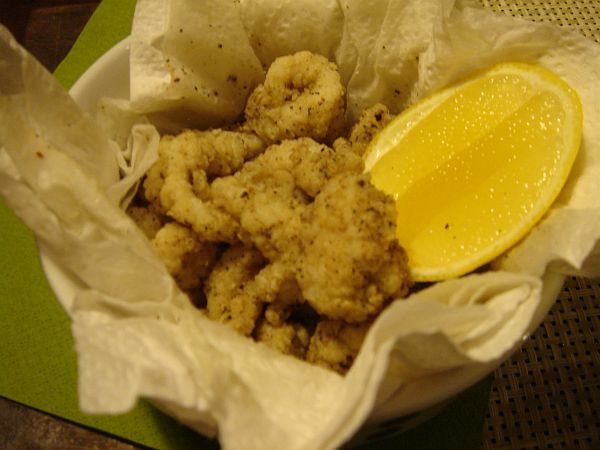 Gently drop squid pieces into the hot oil to fry. Do not over crowd the pan, rather, cook in batches so the oil doesn't lose temperature. Cooking time should only take about 30 seconds. The squid pieces will curl up and go from slightly translucent to white. Be sure not to overcook, as your squid will become rubbery and tough and no one likes that! Drain on paper towels and sprinkle over reserved spice powder and extra salt if desired. A squeeze of fresh lemon juice really makes the flavour pop! With my two squid tubes costing me a King's ransom of $2, a cafe/restaurant quality entree is never too far out of my reach.